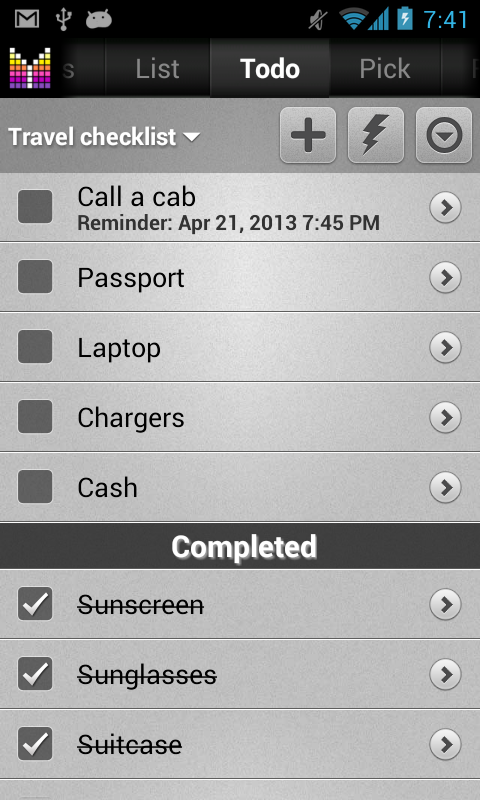 If you’d like to build a simple list of items or create a checklist, Todo feature is what you need. Enter item Name, Comment, or set Reminder when editing an item. To remove completed items from your todo list, just tap Side menu button in the upper right hand side of your Todo list and choose Delete completed. 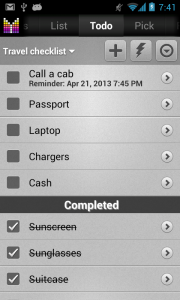 To change order of the items switch to Edit mode using the Lightning button and use handle on the right side of the row. When will we have the ability to edit to-do list from my desktop? Patty, we are working on this feature and I hope it will be available soon. Unfortunately, no specific date is available yet. Thank you for your patience and understanding. Thanks for the add-on of to-do lists. However I could not find any way to have this list sorted according to the expiration date, having therefore the most urgent listed first. Could you please consider this or tell me how to do this? Michel, thanks for your feedback. We will consider sorting ToDo items by Expiry date going forward. Is it possible to share todo lists via cloud? Hi Kim, thank you for your question. Yes it is possible to share to do lists via cloud. Just go to Menu > Settings > Accounts > (your account) > cloud actions > Push list – to share todo list, and then on another phone just pull the list. Unfortunately to do lists are not accessible via web interface but we plan to add this feature going forward. Please let me know if you have any further questions or comments. I’m sorry if I’ve missed how to do this, but how do I set a reminder in the to do list? Cherry, to add a reminder to an item in to do list, just open item for editing and enter your date and time. The reminder will appear in the notification bar at requested date and time. Please let me know if you have any further questions or comments. I was wondering if there’s a way I could print out my ToDo List from my handset so I do not have to refer to my phone each time I want to delegate a job to someone? Don, you can share a To Do list via email (List tab > Menu > Share > select Email app > Send). And that email can be printed. In the future, it will be possible to print lists using My Mighty Grocery website. Please let me know if you have any further questions or comments. Hi. What I would like to see and would be incredibly useful would be for ToDo to be able to import an existing list within Mighty Grocery. I don’t use all of the very powerful features that are in mighty grocery, but I like the idea of making my lists more concise. What I do now is just uncheck the master list of what I need each time I go to the store. Hi Barry, thanks for your feedback. We will consider this feature going forward. I found your Todo feature very useful for my recent travel and packing checklists. What I would like to do is have a master list and then select particular items for each trip, similiar to the pick feature for shopping lists. Is there a way to do this? Tonya, unfortunately master list for Todo lists is not available yet. We may consider this feature in one of the upcoming updates. Is there a way to change the order of my todo items? I want them listed in the order in which I wish to do them. Hi Mendy, thanks for your question. Yes, it’s possible. To change order of the items switch to Edit mode using the Lightning button and use handle on the right side of the row to move items up and down. why todo list not synced with the cloud? Hi Vlad, sorry about that. Ability to modify Todo lists will be available going forward. Thanks.. that just answered my question.. Hopefully this function will be available soon.. as I’m wanting to use it for my kids and their daily chours.. that way I can add to it whilst I’m out if need be. How do you remove the completed items in the todo list? Debbie, thanks for your question. The above documentation has just been updated to reflect your question. Thank you!